Teaching Music with iPads training provides everything you need to deliver high-impact composition and performance projects using iPads. Over the course of the day, we will explore tasks that develop musicianship and music theory through structured composition and improvisation tasks. 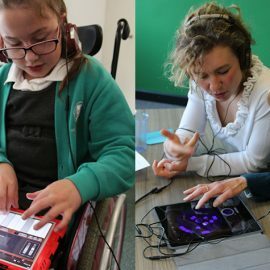 Activities will be based on best practice when using tablet technology to teach music, with clear links to the National Curriculum and a strong cross-curricular emphasis. The course is designed for both specialist and non-specialist musicians at KS 1 – 3, including those who have never touched an iPad before! All courses include a copy of our comprehensive teaching resource ‘Teaching Music with Garageband for iPad‘.